The brilliant, slightly awkward high school student Virgil Hawkins transforms into the cocky electromagnetic hero Static! A mysterious tragedy forces the Hawkins family to relocate from Dakota to New York City! Virgil embarks upon new adventures in a new high school and a new internship at S.T.A.R. Labs! As Static, he dons a new uniform and establishes a new secret headquarters! But is he ready to take on the new villains who lurk in New York City’s underworld? 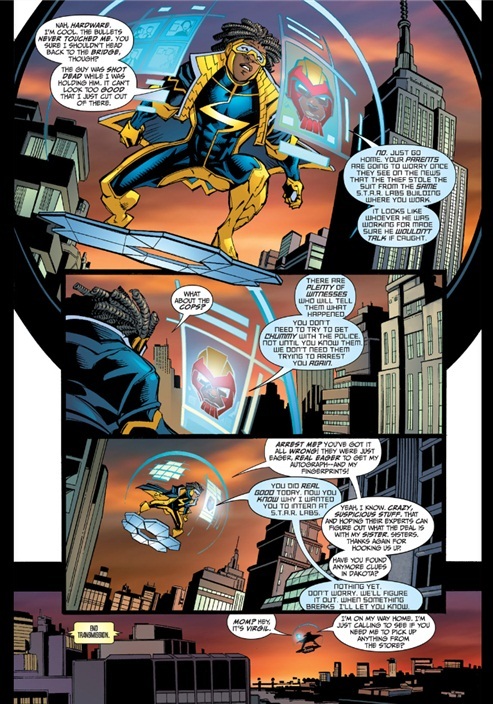 Static, new resident of New York is battling a man in a power suit who is making his escape from star labs. He manages to save the day with quick thinking although in the process he destroys allot of personal property. Villain in hand his powers save him from untimely death though his prisoner is not so lucky. The villains escape and static contacts Hardware before heading home. Static then becomes the target of the new team of supervillains. The issue ends right as they make contact. Hardware- Who told these guys I wanted Hardware because lord knows I’ve been dieing for dc to use him in any capacity! My man Curt is now essentially Static’s mentor…his “oracle” if you will as well as his financial backer. Awesome way of keeping Static‘s ties to Dakota and the Milestone brand despite his relocation. Costume- I can easily say this is my favorite static shock costume EVER! hated the original, didn’t care much for the cartoon version but this? oh lord preserve me I’m in love! Tech goggles and gloves supplied by Hardware, Holographic displays? yes please! more yellow than blue? still has the jacket? yup Static gets a modernized tricked out suite that brings him square into the “modern age” Can’t wait to see what other tricks are up these snazzy new sleeves! Fate of the Dakotaverse– Thank the gods! We get confirmation in this issue that Static is not the only surviving Milestone character in dc’s reshuffled universe. We can all breath a sigh of relief as Hardware still in Dakota will be our main tie back to the rest of Milestone. This also means whether or not more Milestone alum eventually make an appearance is all up to the writers (Foaming at the mouth to see Icon and Rocket) You guys just blew my damn mind! Characterization-Spot on characterization across the board in this book. Hardware is smart and mature. Static and his sister still have that old sibling contention, he still hates anyone knowing his middle name “Ovid” haha, Mom and Dad still on his back about school etc this is Static the way Dwayne McDuffie would be proud of it! Loving every second! Kudos John Rozum! Action– Nice fight rings the issue in and ends things. Art– The artwork manages to fit nicely into a cartoonish groove without being minimalistic, allowing a good deal of Static’s larger “cartoon” audience to recognize the titular hero and hopefully reel them in. Verbose much?- Ok if you lived and read comics in the 90’s you know that you probably had to take a bathroom break while reading each issue because there was so much prose. While Static is not as annoying to read as say Brian Michael bendis New Avengers #1 in terms of exposition, lets be real here, comics have changed allot since the 90’s modern comics are like reading a movie the images are used to carry the story NOT the prose so what we often get is a book with lots of splash pages and the like. If your a modern comic book reader who’s used to and like that, chances are you’ll be put off by all the exposition. Accessibility- One small problem, there’s an assumption made from the beginning to the end of this book…that everyone knows who Static is…..because of this there was no info box or panel dedicated to telling those new readers (the ones the relaunch is supposed to be catering to) who the hero is, what his powers are, how he got them etc. Shame too, instead readers will have to hit the net to find out what they need instead of having a complete comic in hand. This hold true as well for the inclusion of Hardware a character even more obscure than Static…..no info box explaining who he is 🙁 fans coming from the tv show will be pretty darn lost! Static Shock (tv show)- Sorry to say kids but this series has its roots firmly planted in the mcduffie static comic series of old, so if you came looking for “Bang babies” and other pale imitations of cooler comic concepts prepare to be very lost and very disappointed. Naruto #526: Full of Black Superhero References!